Complementing the existing range of co-extrusion cast film lines, Labtech Engineering presents the world’s smallest co-ex chill roll line of its kind. 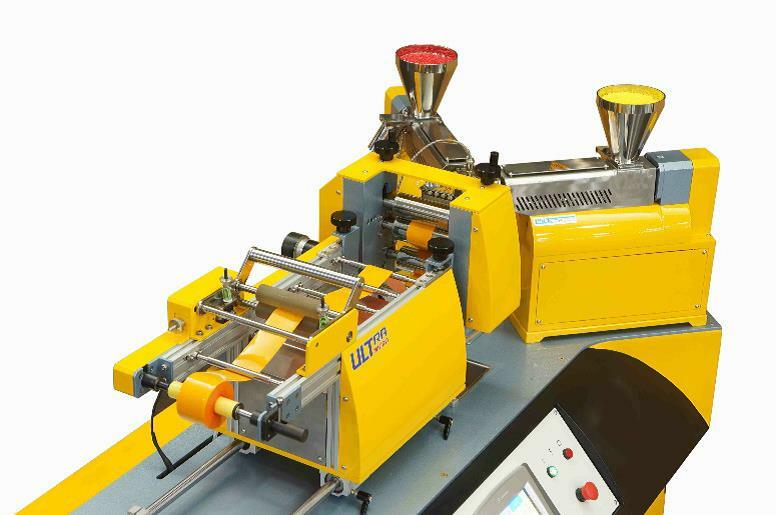 The line features two conical extruders that can use regular plastic pellet sizes due to the 18mm diameter infeed gradually reducing to 8mm at the screw tip. The section feed block divides the flow into layers A+B+A and ensures an even thickness which is regulated by the extruder speeds, driven by infinitely variable speed servo motors. The flat die is a coat hanger type with adjustment screws so that the lip gap can be set from 0.1mm to 0.3mm. The three rolls in the rolling stack are double walled for internal heating and cooling, and connected to a built-in water tank with circulating pump. The sub-cabinet contains the custom-built tank which, due to its size, can be used for several hours without the need for an external supply of cold water. The sub-cabinet also contains all the electrical components which comply fully with CE and other safety standards. All the functions on the Ultra Micro co-ex chill roll line are controlled with a touch-screen computer with clear and easy to understand graphics.